Vision 2030 is a vision statement created in 2010 to define a 20-year vision for the Provo community. Rather than focusing on tiny details, it takes a higher, broader look at where Provo is heading. Now that some time has passed, updates are needed and Provo City is looking toward the year 2050 to set goals. Council discussed the process of updating what will become Vision 2050 and aligning the General Plan with it. Council's plan is to have the Vision 2050 document created along with a timeline for public vetting of it. Neighborhoods will be asked to meet and discuss the document and send their feedback to the Council. 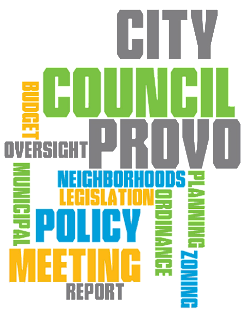 Because Vision 2050 will guide Provo City decisions for years to come, now is the time for Provo residents to take a look and let the Council know what needs to be added or updated. We believe Provo is an inspiring place to live, learn, work and play. Discussed the use of body worn cameras by the police department. The police department presented several options they've researched and will work with the administration to develop policies for use of the cameras, data storage, etc. When ready, this will be presented again to the Council. Discussed collateral assignment of tax increment financing documents for Brixton Capital. This will be formally heard in the May 17 Council Meeting. Discussed the Council Executive Director's duties. This will be formally heard at the May 17 Council Meeting. Heard an update from the Development Application Process Review Committee. Held a follow-up discussion regarding the review of Community Development fees from the Consolidated Fee Schedule. These will be formally heard at the May 17 Council Meeting. Discussed the General Plan update regarding the old county jail property. The neighborhood planning process will continue. If the result of the Neighborhood Plan is different than the current General Plan, consideration should be given to changing the General Plan. Heard an announcement regarding the Utah Municipal Power Agency (UMPA) purchase of a natural gas-fired power plant located in West Valley. 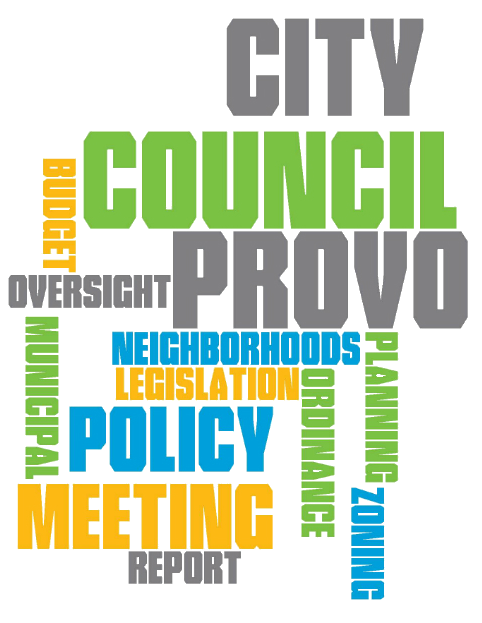 Council members were presented with the proposed Provo City budget for the fiscal year (FY 2017) beginning July 1, 2016, and ending June 30, 2017. Administration staff presented an overview of the budget. The Council voted 6-1 to defer the tentative adoption of the proposed budget until the May 17 Council Meeting. This will give them additional time to review it. The legal requirement is that the tentative budget be "reviewed, considered, and tentatively adopted" prior to public hearings on the final budget. When the tentative budget is adopted, the date and time of the public hearing will be set. Council has until June 22 to formally adopt the budget, unless a Truth in Taxation hearing is required. A Truth in Taxation hearing would move the deadline to August 17. Tentatively adopting the budget simply tells the public that this is the budget we will be considering at the public hearing and we will want your feedback at that time. The Council's Budget Committee and Council staff will be assisting with the budget review process. 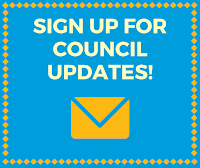 Watch the Council's blog for more information as it becomes available. We will also be making updates to the budget page on the City website. Beth Alligood, Lakeview North Neighborhood Chair, talked about how much her neighborhood is growing. They are on the northwest side of the city and they are a diverse area. The neighborhood really appreciates efforts by the City Council and Mayor to consider the west side's thoughts and needs when development happens. The new Provo High School building just had its groundbreaking, bringing even more change to the neighborhood. Viewed the Covey Center preview from "The Foreigner." Welcomed Aaron Skabelund of the Provo Bike Committee to present the 2016 Spring/Summer Golden Spoke Award to Susan Kreuger-Barber and recognize the group that did the complete street project in the Joaquin Neighborhood. Unanimously approved a resolution authorizing the Mayor to submit an application for a Utah County Municipal Grant to be used for a project to renovate the Provo River Trail. Unanimously approved a resolution authorizing an appropriation to repay remediation costs on property once owned by the Redevelopment Agency. Held a public hearing and unanimously approved an ordinance amendment to specific Provo City Code sections in order to clarify code and update planning application submittal requirements. Held a public hearing and unanimously approved a request by Ivory Homes for an ordinance amendment regarding the setback allowance in side yards in single-family residential areas in the Lakeview North Neighborhood. Held a public hearing and unanimously approved a request by Adam Hall for a zone change from Residential Conservation to Low Density Residential to facilitate a three-lot subdivision for a property in the North Park Neighborhood. Held a public hearing and unanimously denied a request by Brian Dabb on an ordinance text amendment to allow six-foot, solid fencing within the front setback in residential zones.